BearSleuth Contest: Which is going to be the better film: Batman V Superman: Dawn of Justice or Captain America: Civil War? 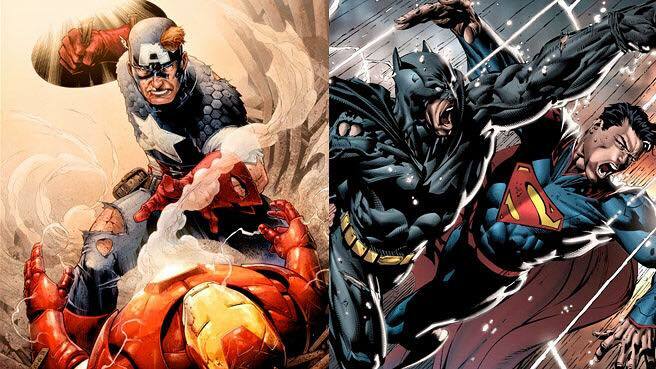 Next years will see possible the greatest competition because Marvel and DC as Batman V Superman: Dawn Of Justice steps into the ring against Captain America: Civil War. I wanted to take stock of the various opinions on the this battle with this weeks BearSleuth Contest and I was staggered by the variety of strong arguments on the subject. This week was really tough and I would like to reiterate that the winner of the contest is not the argument I agree with but instead the one that is structured the best and makes the better points for its side of the debate. Civil war, it’s made by Marvel and its a better comic too. I read the comic a while ago but maybe I should read it and Dark Knight Returns again and see. Civil War is a favourite of mine so I am biased. Edgar Wright did pull out of Ant Man due to creative differences with Marvel which made me worry about the film but it was still brilliant. It seems like Marvel can do anything. They’ve called it Captain America: Civil War so maybe it will be different from the comics as Captain America was only a leader of one half of the great divide created by the registration act. That said Batman V Superman does look very promising. Maybe it’ll be the first live-action Superman film that I will enjoy. Whether or not that will be because Superman isn’t the only central character of the film. Creative freedom will definitely attribute to the success. Do I even need a reason… Other than Mark Millar had no involvement in any sort of way. Also on a more serious note. Batman V Superman will be the better film because Warner Bros gave that statement about trusting their directors and giving them more creative freedom, whereas with Marvel there’s the Edgar Wright incident, the current Joss Whedon stuff & the whole thing of James Gunn having to force Thanos into Guardians because Fiege. The lack of creative control leaves me feeling pretty pessimistic about the next Marvel films. After a lot of consideration, I expect Batman V Superman to be the better film from a purely critical standpoint. Zack Snyder is a master of filmography and with the right script he could make something that will redefine the superhero genre as he did with Watchmen. That being said I feel like I will probably personally enjoy Civil War more as I am incredibly invested in the Marvel Universe and I have no doubt that Civil War will be the more commercially successful film. So I guess my answer is that both films will have different strengths and weaknesses and really anyone that’s interested in watching one should probably watch the other as competition breeds creativity that’s something we can all enjoy, Marvel and DC fans alike. …And that’s this weeks BearSleuth Contest! Check back on the BearSleuth Facebook page for the next BearSleuth Contest. Also come back on Friday for this weeks BearSleuth Bundle.